Sandhurst Memorial Park - Since its humble beginning in 1949 when 2.4 hectares of land known as Brookside Field were purchased by Sandhurst Parish Council "for the purpose of a public recreation ground for the benefit of the inhabitants of the Parish of Sandhurst", successive Parish/Town Councils have gained the rights over adjacent farm and woodlands to make the Memorial Park what it is today. Shepherd Meadows - during medieval times, this area played host to regular hunting parties from nearby Chertsey Abbey. Over the years what is now Shepherd Meadows changed hands many times and, at the turn of the century, it was used by the Royal Military Academy as a training ground for the British Army, with cadets practising their drawing and map-making skills here. 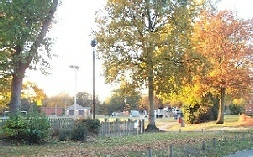 In the late 1980s, the College Farm residential development and the building of a large shopping centre on adjacent land provided the opportunity for Bracknell Forest Borough Council to acquire the remainder of the land to complement the existing nature reserve and public open space. The woodland are dominated by Oak, Ash, and Alder coppice and includes spring displays of Wood Anemone and Dog Violets. The meadows are also rich in animal life with over 600 species of insects. During the spring the Orange tip butterfly darts low over the vegetation in search of the Cuckoo Flower on which it lays its tiny orange eggs. Damsel and dragonflies breed in the ditches and along the riverbanks, and in late summer the meadows echo to the sound of grasshoppers and bush crickets. The meadows become a carpet of wildflowers and plants during the spring and summer months, with golden Meadow buttercups, blue Devil’s-bit Scabious, purple Meadow Thistle and the yellow Birds-foot Trefoil. In July and August the sweet scent of Meadowsweet blossoms produces a heady aroma. Birdlife at Shepherd Meadows includes flocks of Siskins, Meadow Pipits and Thrushes in winter, while in summer the site is home to breeding Kestrels, Warblers, the Spotted Flycatcher and Woodpeckers. The River Blackwater and the feeder channels attract many waterfowl and wading birds. Sandhurst Memorial Park, an area for sport and informal recreation and Shepherd Meadows, a nature conservation site, are neighbouring sites on the River Blackwater in Sandhurst. Shepherd Meadows, named after wildlife artist David Shepherd, is a Site of Special Scientific Interest (SSSI) in the south of the Borough. Covering approximately 28 hectares, this site, managed by Sandhurst Town Council, has become one of the premier recreational sites in Bracknell Forest. In 2004, Bracknell Forest Borough Council teamed up with Sandhurst Town Council to enter Sandhurst Memorial Park and Shepherd Meadows into the scheme - resulting in the first ever joint application Green Flag Award. A management plan for the sites was developed in conjunction with BBOWT (Berks, Bucks & Oxon Wildlife Trust) and the Blackwater Valley Countryside Partnership. The site covers about 100 acres of wet wildflower meadow and woodland straddling the River Blackwater at the point where the counties of Berkshire, Hampshire and Surrey meet. Flower-rich meadows are now rare and about one quarter of the species associated with herb-rich grassland in Berkshire can be found at Shepherd Meadows. Acquired by Bracknell Forest Borough Council in 1990, the site is managed for its nature conservation importance and its recreational and landscape value. Whether your idea of recreation is sport, walking, nature or sheer relaxation, Sandhurst Memorial Park is the place to visit. Sandhurst Memorial Park in a joint application with Shepherd Meadows in Sandhurst has been recognised by the Green Flag Award Scheme as one of the very best in the world. Sandhurst joins five other green spaces awarded recognition in Bracknell Forest. The park is among a record-breaking 1,883 UK parks and green spaces that will today receive a prestigious Green Flag Award - the mark of a quality park or green space. “The Green Flag Award is due to the hard work and dedication of all the staff at Sandhurst Town Council in providing an award winning leisure area for all residents of Sandhurst to enjoy”.